The word “formed” is the Hebrew yatsar (to form, to fashion, to shape). This is the same word used for potters forming clay into vessels with a variety of purposes. It’s not surprising that we see God forming man “of the dust of the ground” since potters clay comes from the soil of the ground. The word “dust” comes from the Hebrew aphar, which was used for the finest part of the soil. When God speaks of Himself as “the Potter” who “formed” man, He is simply referring to the process He used to fashion the first human being from the dust of the earth. What happened after God “formed” man from the dust of the ground? He “animated” him by breathing into his nostrils “the breath of life.” The word “breathed” is the Hebrew naphach (to breathe with force, blow) and demonstrates God’s active involvement in giving man “life” (Hebrew hay – alive, having vital energy, living). God “formed” man from the dust of the earth, then “breathed” into his nostrils the “breath of life” (Hebrew neshamah hay – breath of vital energy) and that’s when man became a “living being. What does this tell us about God? That He is intelligent, creative, resourceful and alive. We also see that God is a “superior” being to the man and animals He formed from the ground. 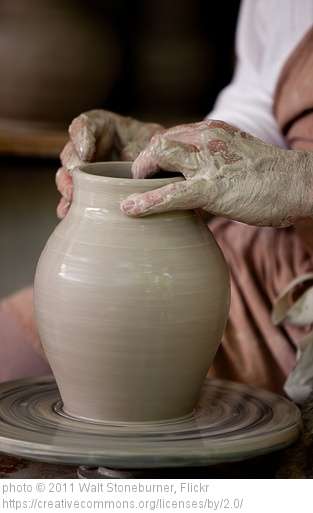 That’s why Paul wrote, “Will the thing formed say to him who formed it, ‘Why have you made me like this?” God is the Potter and human beings are the clay. That’s the way God formed the first man and the way He continues to view us to this day. Satan’s attack on the Church stems from how created things relate to God. God is infinite (without limits, impossible to measure, boundless) and immortal (undying, deathless, not subject to death, living forever). Man is finite (limited, capable of being measured, having bounds) and mortal (dying, subject to death, certain to die). Satan is an angel (e.g. 2 Corinthians 11:14) and a leader of angels (e.g. Revelation 12:7-9). God created angels (e.g. Psalm 148:1-6; Colossians 1:16) as “spirit” beings (e.g. Hebrews 1:7, 14). However, God did not create angels in His image; that was for man alone (e.g. Genesis 1:26-27). Did the fact God made man in His image, His likeness, bother Satan? Is that what drove Satan to rebel against God and deceive the first human beings? Maybe. Or maybe Satan wanted to hurt God because of what happened to him because of his pride and evil desire (e.g. Ezekiel 28:11-19;). Whatever the reason, Satan attacked the first humans as soon as he could. That attack began a tsunami of destruction that will not end until the end of time. The analogy of being (analogia entis) is a philosophical concept relating to the unique existence of all living beings and their analogous relationships. God is superior to all other living beings because He created them. God created angels to be “ministering spirits” and to worship Him (e.g. Hebrews 1:6-7). One of the responsibilities of angels is “to minister for those who will inherit salvation (e.g. Hebrews 1:14). This helps us understand some of the challenges we have in understanding God. God is infinite and immortal. His knowledge and experience are unlimited and undying. We are finite and mortal. Our knowledge and experience are limited and dying. How can the finite and mortal understand the infinite and immortal? There are three basic ways of understanding being: univocal, equivocal and analogy (also known as univocity, equivocity, and analogy). Univocal is understanding a word to mean the same thing (e.g. John is a man, you are a man, they are men). Equivocal is understanding a word in different ways (e.g. I threw a ball, the umpire said the ball I threw was a ball instead of a strike, our friends are going to dance at the ball tonight). Analogy is understanding a word to have a similar meaning (e.g. my son is a fish when he gets in the water). There’s no question that God “created” the first man and woman in His image. What about the children of Adam and Eve? Does God “create” every child in the womb? Does He begin afresh and “form” each boy child from the ground and “make” each girl child from the rib of a man? Of course not. So, in what image are we? God answers that question soon after He removed Adam and Eve from the Garden of Eden. Seth and all of other children who were born from Adam’s lineage (including us) are “begotten” in Adam’s own likeness, after his image. The Hebrew word is yalad and used almost 500 times in the Old Testament in the sense of conception and birth. The first time we see yalad used in the Scriptures is Genesis 3:16 – “To the woman He said: ‘I will greatly multiply your sorrow and your conception; In pain you shall bring forth children; Your desire shall be for your husband, And he shall rule over you.” The idea of “bring forth” children is the full process of bringing human life into being – from conception to gestation to birth. English translators of the Old Testament have chosen many words to represent the meaning of yalad depending on the context (e.g. begot, begotten, beget, father, bore, childbirth, give birth, born, in labor, have children, midwife). The Greek word for “beget” is gennao (to be born). Examples are Matthew 1:2-16 and Luke 1:13 and 57. The word “generation” in Matthew 1:17 is the word geneai (kindred, offspring, family, tribe), which is from the same root for gennao – ginomai (to become, to become, to come into existence, origin). The word “genesis” comes from ginomai. This idea of humans being yalad or gennao in the image and likeness of Adam is supported in the New Testament. Jesus is the “express image” of God (e.g. Hebrews 1:3, Colossians 1:15) and we are being conformed (summorphos) into the image (eikonos – likeness) of Christ. So, given all that, how does the infinite, immortal God communicate His knowledge and experience to finite, mortal human beings? That’s the importance of God’s Word – He communicates infinite ideas in ways that finite beings can understand. Israel’s King David said, “The Lord is my rock” (Psalm 18:2). Is God a literal rock? No. David used the word in a metaphorical sense. David also wrote in that same verse that God was a fortress, deliverer, strength, shield, horn of salvation, and stronghold. King David, who was a shepherd as a child, said God was his “shepherd.” Another metaphor. God is called “wise” (Job 9:4) and so is Solomon (1 Kings 5:7). Is their wisdom to be understood as being analogous? The Apostle Paul wrote that God is “alone wise” (Romans 16:27; 1 Timothy 1:17). How can that be true when Moses chose “wise and knowledgeable men” from the tribes of Israel to help him rule over the people of God? (Deuteronomy 1:15) The Prophet Ezekiel wrote that before Satan sinned against God he was “Full of wisdom and perfect in beauty” (Ezekiel 28:12). Do angels have “full wisdom” that compares to the wisdom of God? How can that be? The answer is in the vast difference between the Supreme Being, angelic beings and human beings. God is Eternal, All-Powerful, All-Knowing, Everywhere Present at the Same Time, and Unchangeable. Words describe and compare, but they have to be used in a way that can be truly analogous. There must be enough of a similarity to afford a comparison of beings. There is really only One Supreme being, but the Israelites had lived in Egypt for several generations and shared a common misbelief that there were many “gods.” They saw the many carved idols that represented the Egyptian gods and believed these gods had supernatural powers. That was the primary point of God’s attack on all the gods of Egypt (Exodus 12:12), in addition to freeing Israel from slavery. God’s plagues on Egypt were proof that He alone is Supreme. When Paul wrote that God is “alone wise,” he was using the word as descriptive of the Being who is unlike any other being and above all other beings. When Ezekiel wrote about Satan being “full of wisdom” before his disobedience, the prophet was using the word as descriptive of an angelic being who could be compared with other angelic beings. The writer of 1 Kings wrote that Solomon “excelled the wisdom of all the men of the East and all the wisdom of Egypt. For he was wiser than all men—than Ethan the Ezrahite, and Heman, Chalcol, and Darda, the sons of Mahol.” (1 Kings 4:30-31) It was possible to compare Solomon’s wisdom to the wisdom of all the men of the East and of Egypt because they were all human beings. Atheists and agnostics often attempt to compare God’s attributes, thoughts, intents and behavior with that of human beings. The problem is that God and humans are not analogous; not even close. Analogous things can be compared to each other, so how do you do that with God and humans? There is no method to compare the immortal with mortal, the infinite with the finite, the All-Powerful with limited power, the All-Knowing with limited knowledge, Everywhere Present at the Same Time with limited to one place at a time, Unchangeable with changing often. Without a method to compare it is impossible for the limited to understand the “limitless.” That doesn’t mean we cannot know God or understand something of “His ways,” but it does mean we are limited in “how” we can know God and understand His ways. An unbeliever must be open to the “possibility” that God exists if they are ever to be open to evidence of His existence. Being open to “possibility” is not the same as being open to “probability.” An atheist will not begin an investigation into the claims of theism believing in the “probability” that God exists. They would be a weak agnostic if they believed in the probability. However, an atheist or strong agnostic cannot be truly open to the evidence for God’s existence until they are open to it as a possibility. As I investigated the claims of theism several decades ago I realized I could not be honest in my investigation until I was open to the “possibility” of God’s existence. Atheists often ask me how I could have changed from being an atheist to a theist. I explain that after becoming an honest investigator I saw how how much real evidence there was for the existence of God and His Son Jesus Christ. My challenge to anyone who attacks Christians for their belief in God is whether they are willing to be open to the possibility of God’s existence. If they are, we can look at the evidence together. If they are not, then they are not ready to be honest about the evidence. An investigator who is not open to truth will not find it. Christians are under strong attack, but not without strong defense. In the next part of our study, we’ll look at another aspect of the analogy of being to help explain the vast difference between God and His creation and how important it was (and is) for God to reveal Himself to humanity and have a relationship with them.